On 3 May 2017 the ECON Committee has organised a Public Hearing on Common (Consolidated) Corporate Tax Base and a follow-up of the TAXE/TAXE II committees’ demands. The two legislative proposals - on a Common Corporate Tax Base (CCTB) and on a Common Consolidated Corporate Tax Base (CCCTB) - have a two-fold objective: to facilitate business within the internal market by subjecting taxpayers to a single rulebook and to make the system more robust and resilient to aggressive tax planning. In addition, the CCTB proposal includes incentives to help businesses to expand within the internal market. 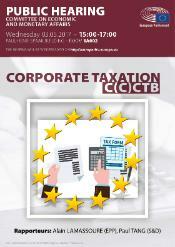 The CCCTB would enable a company to file only one tax return within the EU. The purpose of this meeting was to hear the views of various stakeholders in view of preparing European Parliament's reports. The hearing was made of two panels. Firstly, Members heard business representatives and later on other stakeholders representing trade unions and an advocacy group. Presentations were followed by Q&A sessions with Members. The hearing was webstreamed on the ECON website.